The genesis of the Orpheus company and its sister corporation, Anagram Technologies, occurred as a result of a little-known incident. I heard the tale from one of Anagrams founders, Swiss engineer Florian Cossy, after wed both had a few warm sakes in a Japanese restaurant and were wandering back to our hotels through the streets of Montreal. As the story goes, the young Florian went to signal-processing legend Mike Storey, designer of the dCS Ring DAC, with a new idea for the time-based modulation of a digital signal. Storey, unmoved, flatly told him it couldnt be done. Feeling spurned, the young Cossy promptly returned to his canton at Lake Geneva, Switzerland, poured himself a cup of steaming hot cheese, and began work on his revolutionary Adaptive Time Filtering technology. A few patents and a few years later, in 1998, Cossy and partner Thierry Heeb launched Anagram Technologies, a digital-signal-processing company that now contracts with firms around the world in a variety of fields relating to information processing. Cossy and Heeb went on to found sister company Orpheus Laboratories, which manufactures a line of high-end modular audio components named the Zero (a CD player) through the Four (an integrated amplifier). The D/A converter, the Orpheus One ($4800 USD), puts Anagrams signal-processing technology to full use. The Orpheus One is a long, flat box of the same dimensions as all Orpheus components: 19" wide by 2" high by 15" deep. Also like the rest of the line, the One sports a silver front plate with the Orpheus logo to the left, and a power switch on the rear panel. The Orpheus design philosophy is one of modularity and uniform, no-nonsense looks. The One is shipped with a single D/A conversion card that accepts both RCA coaxial and XLR balanced digital inputs. The analog outputs are balanced XLRs. To convert the balanced outs for use with my single-ended amplifier, I used the excellent Orpheus Strings conversion cable. (The DAC card can also be ordered with single-ended RCA outs.) 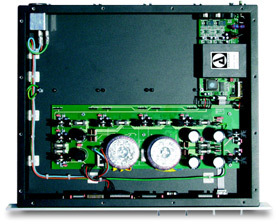 The chassis can accept three more cards, for a maximum of eight DAC channels for a multichannel system. The One accepts sample rates of up to 96kHz, and upsamples automatically to 24-bit/192kHz. The Orpheus One is set-it-and-forget-it simple. Each card has a single toggle switch on the front panel for selecting between the RCA (S/PDIF) and XLR digital inputs. Thats it. There is no volume control, so the One cant be used as a preamplifier. My review sample locked on to signals with no trouble, and worked flawlessly during its ten months in my living room. My review system included a Sony SCD-777ES SACD/CD player acting as a transport through a dCS Purcell-Delius upsampler-DAC combo ($16,000). I also used a Weiss Medea DAC ($13,500). The digital interconnect was MIT Digital Reference, and the output of the dCS Delius (which has a remote volume control) went directly by way of MIT 350 interconnects to my KR Enterprise 300bsi single-ended tube power amplifier, thence to a pair of JMlab Electra 315.1 speakers via Cardas Neutral Reference biwire. Bell-voiced Christy Baron does a lovely rendition of the Stevie Wonder classic "Summer Soft" on her Thought About You CD [Chesky JD152], accompanied by double bass and some sparse piano. The Orpheus did an excellent job of reproducing the nuances of Barons voice, with a very decent soundstage and good freedom from digital artifacts -- the effect was spellbinding. Overall, it was a touch weak in the bass, but with very quick response to changing transients, and nice clarity. The Ones performance, compared with my SCD-777ES used as an integrated player, made the Sony look sick -- and as a one-box player, the Sony is very good. Björk Guðmundsdóttir, aka Björk, is a strange little artist from Iceland whose haunting melodies have always grown on me. Like many of her recordings, the well-known song "Human Behavior," from Debut [Elektra 62787-2], is a complex dance mix of heavily synthetic rhythms overlaid with tons of reverb and other digital effects. The challenge for a DAC is to sort out all the complexity without losing the timbral qualities of the individual sounds. The One did a marvelous job of this. Björks voice soared above the crashing drums and synths with just the right balance of realism and otherworldly effects. Bobby McFerrin has again pushed the bounds of a cappella with his Circlesongs [Sony 62734], a collection of repetitive, chant-like choral music. The hypnotic qualities of these mantras came very nicely through the One, which again demonstrated a good ability to sort out the complexities and keep a brisk pace. These tracks did tend to tax the One at the very low and very high ends of the frequency spectrum, with just a hint of sheen in the top, but the overall effect was very satisfying. In comparison with the other DACs I had on hand, the Weiss Medea had better bass and a more bouncy pace, but didnt best the One in terms of realism, while the dCS Purcell-Delius combo usually bested the One and the Medea with its tremendous sense of fullness and retrieval of ambient information. The dCS also threw a more complex soundstage, with palpable front-to-back layering of instruments and voices. On the Björk track, the dCS again demonstrated greater retrieval of inner detail, but so much so that the ensemble became rather unlistenable. The Orpheus One was not only listenable, but in this case, more enjoyable. In general, the strengths of the Orpheus One were its clarity and pacing. It was reasonably free from additive artifacts, and its subtractive flaws could be easily lived with, particularly when they made my favorite pop tracks more enjoyable. With my listening preferences and system, I found that, overall, I preferred the performance of the Orpheus One to that of the Weiss Medea, despite the fact that the Medea costs almost three times as much as the One. The Weiss was clearly stronger in the bass, and had more energetic pacing, but seemed to suffer from a bit more digital hardness and upper-frequency-range confusion than the One. The Orpheus Laboratories One is a no-nonsense D/A converter that will give you exactly what you pay for: $4800 worth of extra sound quality from your front end. In addition, it offers tremendous capacity and ease of upgradeability in terms of adding extra DAC channels to your system, and fits nicely into the modular family of high-quality Orpheus Laboratories components. Overall, the Orpheus One sounded fast and crisp, with a touch of sweetness -- the sonic signature of a first-class DAC that can stand up against some higher-priced competition. $4800 is hefty change, but its little more than a third the price of the Weiss Medea, and about a quarter the price of the dCS Purcell-Delius. If youre absolutely determined never to pay five figures for a DAC but are willing to consider four, the Orpheus is the One for you.